In January 2016 Anton Paar successfully launched the SVM™ 3001 Viscometer that offers a unique combination of features for easy, accurate and fast determination of viscosity, density, Viscosity Index and more from a single syringe. Now, the SVM™ series will be further expanded with the SVM™ 2001 and SVM™ 4001. With its temperature range from -60 °C to +135 °C, its unparalleled heating and cooling rates and other unique features, SVM™ 3001 has set new standards in the world of viscometry. 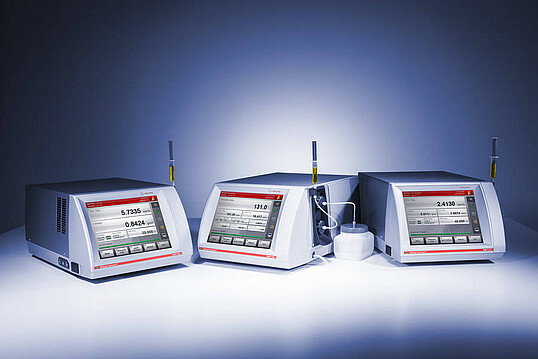 With a unique double-cell system, the SVM™ 4001 Viscometer provides the opportunity to determine viscosity and density at two different temperatures simultaneously. This ensures fast determination of the Viscosity Index from the lowest sample volume. Customers in the petroleum industry, for example, who need to analyze lubricating oils, base oils and additives or monitor the oil condition of an in-service oil will benefit greatly from SVM™ 4001. For Viscosity Index determination, the kinematic viscosity values for 40 °C and 100 °C are needed. Either two instruments are normally required for this measuring procedure, one for the lower and one for the higher temperature, or the user has to carry out the measurements consecutively, which requires waiting between measurements for the temperature to be increased. Now SVM™ 4001 provides these two results simultaneously – from one syringe. The series is completed with SVM™ 2001, which provides new possibilities for conducting highly precise kinematic and dynamic viscosity measurements according to ASTM D7042. SVM™ 2001 is ideal for any constant temperature viscosity determination between 15 °C and 100 °C, such as determination of the kinematic and dynamic viscosity of vegetable oils and fats. By launching SVM™ 4001 and SVM™ 2001, Anton Paar is taking the lead in new viscometry to provide more user benefits in various fields of application.